Mgahinga Gorilla National Park is the Smallest National park in Uganda, covering a total area of about 33.7Km² and lies on an elevation ranging from about 2,227 to 4,127m altitude. However much it is the smallest national park in Uganda, Mgahinga Gorilla National Park is one of the two exceptional National parks in the country that are a home to the famous endangered primate species, the famous Mountain Gorillas. . Mgahinga is part of the Virunga Conservation range that is home to a minimum of 480 Mountain Gorilla’s. Mgahinga Gorilla National Park derives its name from a Bafumbira word ‘Gahinga’, which literally means a pile of Volcanic Stones cleared from farmland at the foot of volcanoes. Bafumbira are of a Bantu ethnic group origin living in Kisoro district, the same district where the National park is situated. The ‘gahinga’ stones are as a result of volcanic activity that occurred on the Virunga Mountains located in the neighbouring areas, spanning from the Democratic Republic of Congo, Rwanda and Uganda. 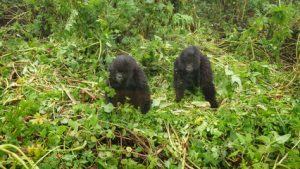 Mgahinga Gorilla National Park lies wholly in Uganda along the border with the Democratic Republic of Congo and Rwanda. 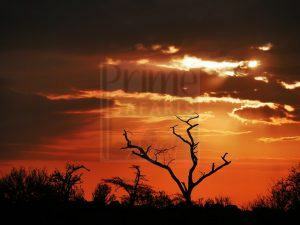 When you think about nature, Mgahinga National Park is a destination you should consider visiting. 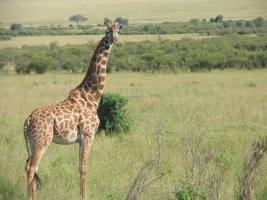 Considering its geographical location of being close to the Equator by a few degrees south, lying within Albertine Rift Valley, Rwenzori range in the north, Volcanoes mountains in the south and Virunga Mountains in the West; Mgahinga is a Nationl park with one of the richest eco systems in Uganda and Africa at large. It is characterized by a montanetype of vegetation, with about 60% of its land at high altitudes, covered with a bamboo forest. Bamboo forest is literally the delicacy home to the endangered mountain Gorillas species. Apart from the bamboo forest, Mgahinga has a wide variety of vegetation that includes giant tree heathers which are found in the ericaceous zone; alpine zone which only naturally grows only in areas above 3,000ft altitude in East Africa and many other plant species. The alpine zone includes species such as the Lobelia, Haegenia and other tree species that give the park a stunning and breath-taking view. When it rains, the forest becomes covered in mist and the vegetation certainly becomes the most beautiful place in the park. A volcanic mountain or volcanoe is a rupture in the crust that allows hot lava, volcanic ash and gasses to escape from the Magma chamber. However, all mountains in Mgahinga national park are extinct volcanoes or domant volcanoes. There are no signs of the mountains to erupt in the naear future, making it safe for one to visit the park without worrying about volcanic activity occurring. Mt.Sabinyo: It derives its name from a Kinyarwanda word ‘Irinyo’ which literally means ‘tooth’. 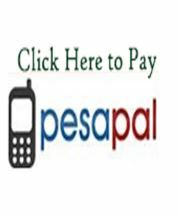 The mountain is an extinct volcanoe, west of lakeBunyonyi and has an elevation of about 3,645m altitude. It marks the intersection of the boarders of Rwanda, Uganda and Democratic Republic of Congo. The mountain is home to the endangered mountain Gorillas. It is also known as ‘old man’s teeth’, because when you view it from a distance, you are able to witness the summit that has a structure like that of worn out teeth in a gum line. 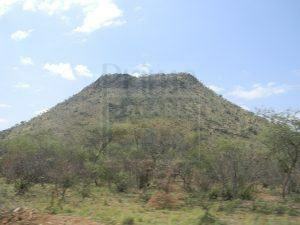 Mt.Muhabura: Also known as Muhavura, it is an extinct Mountain with a height of about 4,127m altitude. The name ‘muhabura’ is a Kinyarwanda word that means ‘the guide’. It is the highest Volcanic Mountain in Uganda. GaramaCave :Along the steep slopes of the mountain, exists the Garama cave. The cave is beneath a plateau, northern edge of the park. It is an ideal underground caving in the Park and in Uganda. It occupies an area of about 342 meters long and is as deep as 14m. The Batwa was used as a refugee ground by the batwa people, A Bantu Ethnic group that is well known to live only in forests. Historically, mountain Gorillas are said to be descendants of the monkey about 34million years ago. About 9million years ago, primates that were to evolve into gorillas split from the ancestors of the human and chimps. You might be having a Gorilla relative because, the share 95% DNA with humans. However, there was a debate on the classification of the mountain gorillas. The species was first named as Troglodytes in 1847, but renamed to Gorilla in 1852. In 1967, Colin Groves, a biological anthropologist at the Australian University in Canberra proposed that all Gorillas should be regarded as one species Gorilla and three sub species which include Gorilla gorillagraueri (low land gorillas in the west of Virunga), Gorilla gorillagorilla(western lowland gorilla) and Gorilla gorillaberingei (mountain gorillas) After reviewing the species, in 2003, the World Conservation Union divided the species into two; Gorilla gorilla and Gorilla beringei. Mountain gorillas are primarily terrestrial species. They entirely live on land and move in a quadruped format, using all four limbs to help in movement. During this kind of movement, it uses its Knuckles to support its weight with curved fingers. However, they are also able to move in a bipedally format of using only legs to move, reaching a height of up to 6m. Like all great apes, its arms are longer than the legs. Mountain Gorillas are diurnal, meaning they are only active during day time. As early as 6am, just like the way a human would wake up to go to work, Gorillas are already on the move in the forest looking for what to feed on. At midday, the species rest by taking cover under trees and canopy like plant species to protect it from sunshine. Later in the evening at around 6pm, the species resumes its activity of looking for food before nightfall comes. Generally, Gorillas are heavy eaters, meaning if they were to be humans and you happened to invite them to a party, you would have to cook a lot of food. Gorillas eat according to gender. Males eat up to 34Kg and females 18kg of vegetation per day. The Presence of gorillas in a particular area is determined by the availability of food, if there is abundant food, they will remain in the area and if there is less food, they will move to other areas. Primarily, Mountain Gorillas are herbivores, feeding on leaves, shoot and stems of about 142 plant Species. Majorly, 85% of its feeds are Stems. However, it also feeds on bark (7%), roots (3%), flowers (2%) and fruit (1.7%). When fresh shoot is available, they move to the area with bamboo forest; and when the shoot is finished, they move to sub alpine regions and feed on soft spots of the giant senecio trees. Gorillas live in social groups that are composed of females, infants and one lead silverback. The lead silverback is usually more than 12 years old and has a role of protecting the group from enemies, and also leading it to areas of feeding. It makes decisions, mediates conflicts and determines movement of the group. The lead silverback is the only one that has the right to make the females conceive. Male infants that grow into adults can either live the group and start up their own or remain in the group and be subordinates of the lead silverback. 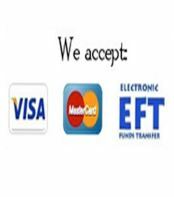 However, females remain friendly towards each other and associate closely. They are able to conceive from the age of 11yrs, however, their first ovary cycle begins at the age of 6 years of age. The female will seduce the male by making eye contact, a move made to urge the male to mount her. If the male doesn’t respond, she will further reach towards him and slap the ground to get his attention. They have a gestation period of 8 and a half months. The infants breastfeed atleast once every hour and by 5 months, they begin to have less contact with their mothers. By around 12 months, they move about 5m away from their mothers. 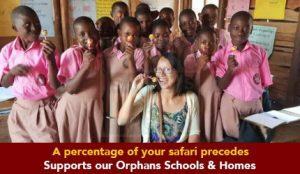 By 6 years, there is no or there is less contact of the infants with their mothers. 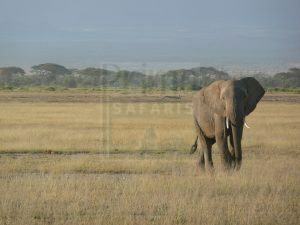 At this time, the mothers soon begin to ovulate and become pregnant again. According to scientists and researchers, Gorillas are a highly intelligent species. They can laugh, develop strong family bonds; think about the past and future; and are believed to have spiritual feelings. It’s believed to be a species of Old World monkey and subspecies of the blue monkey. It has a golden-orange patch on its upper flanks and back. The specie is endemic to areas with abundant fruit and bamboo. Gold monkeys are opportunists in a way that they take advantage of climate change. Climate change basically determines the presence of the specie in a particular area. During the rainy season, there is growth of abundant bamboo shoot; therefore, the specie will remain in areas with the shoot. By the time the shoot gets finished, ripe fruit in the forest is available. The specie will then migrate to those areas with ripe fruits. However, Golden Monkeys will remain in areas which have both bamboo shoot and fruit at the same time. 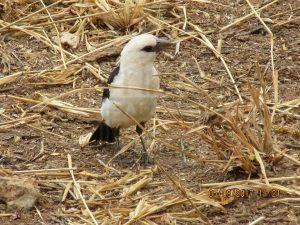 They move in groups of up to 62 individuals, at higher elevations, often feeding and playing in the bamboo forest. Golden Monkeys primarily feed on young bamboo leaves and branches, fruits, flowers and shrubs. They often use a combination of bamboo plants that they weave together to make sleeping beds. They sleep s in groups of four at the top of bamboo plants. A collective judgment of scientists has it that birds are of dinosaurs’ origin. They share features such as hollow pneumatizes bones, nest building and incubation behaviors. Bird species are the reason as to why Airplanes exist. If they were made by human beings, birds would be referred to as something manufactured out of extreme engineering, due to its capability to fly using a system of feathers. For years, humans admired how birds flew in the air, being able to view the world below them up in the sky. This forced humans to put their brains at work and start thinking of how to get themselves up in the clouds just like the birds. Men and women did their best to try navigating air by imitating the birds. However, in the 19thcentuary, 1799, an English baronet; George Cayley made a flying machine with fixed wings. This marked the begging of airplane evolution. The park is home to about 79 bird species which include Cape Robin-chat, Black-headed Waxbill, Bush-shrike, Brown Crowned Tchagra, Kivu-ground Thrush, Dusky turtle Dove, Chubb’s Cisticola, Banded Prinia and many others. 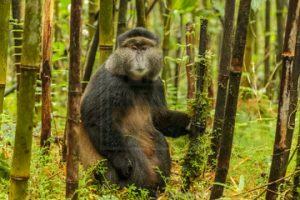 Mgahinga habituates about 4,000 Golden monkeys, living together in the bamboo forest areas and those with ripe fruit. Golden Monkeys are swift climbers and great acrobatics; swinging from branch to branch and jumping from tree to tree. When the forest has a lot of wind, it becomes conducive and easy to track the primate species because then, they will be unable to hear movements of predators that intrude in their territories. Therefore, they climb high up in the canopies as a security measure. This makes viewing of the species easy, because they will not move more often, they will stick up in the trees. Golden monkeys make each day of their lives in the forest different, making it hard to easily predict their next moves, hence making the whole tracking experience interesting at an elevation of about 2,500m altitude. On this trail, you stand a chance to view elephants, giant forest hogs and other mmals. 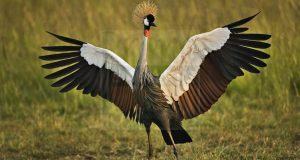 The trail leads to Rugezi swamp, a prime bird watching spot lying towards Rwanda. Birds such as the RwenzoriTuraco, Western Green Tinkerbird, Olive Woodpecker, African Hill babbler, Archer’s Ground Robin, RwenzoriBatis, Montane Sooty Boubou, Lagden’s Bush-shrike and many others can be seen. There are 3 extinct volcanoes where you can choose to hike. They include Sabinyo, Gahinga and Muhavura. The experience might be tiresome, but it’s worth trial because it will forever live in you memories. If you don’t want to strain too much and want to take spend less hours hiking, this is the most suitable trail of all the three hiking trails. It lasts for a about 6hrs round trip and requires less hiking experience or skills. It begins at a flat in farmland where you might be able to view elephants, and begins to become steep as you go at higher altitude. 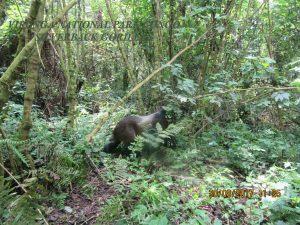 The scenery at higher altitude is breath taking, cutting through a bamboo forest where you might encounter primate species such as golden monkeys and other species. You will also be able to view the swamp at the summit which was once a crater lake. The 14Km trail is the most amazing of all trails. The mountain is shared by Uganda, Rwanda and DRC. 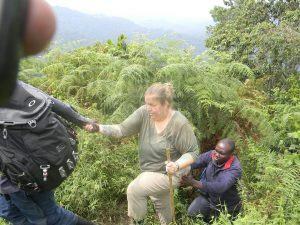 Therefore, while at the summit, you can have one foot in Uganda, the other in Randa and your hands in DRC. The trail could last for the whole day round trip. It stretches up to 12Km and requires a lot of hiking effort. While at the mountain, you can just swim to Rwanda in few minutes on Lake Kivu and back to Uganda. The trail is could last up to 8Hrs round trip. As you approach the summit, you will get astonished by the way the sky opens up. There is a crater lake at the summit which is about 39m in diameter. It takes about 2 minutes to walk from one end of the lake to the other. By walking from one end of the lake, you are simbply walking from Uganda to Rwanda, and back from Rwanda to Uganda. How exciting is that? A rain jacket and trousers to shield you in case it rains. Hiking boots that can be firm on the ground even when it is muddy. Prepared food or Snacks to eat while taking breaks during the hike. Situated at the foot of the park between the volcanoes Sabinyo, Gahinga and Muhavura; the lodge has a luxury touch with 9 en-suite banda huts (4 doubles and 5 twins). It has a massage room, restaurant and fully stocked bar. NB: All Rates are on a Full Board plan. Located 14km from the park, outside kisoro town, the hotel has 12 en suited rooms.It has a restaurant, stocked bar, bikes for rent and lounge. 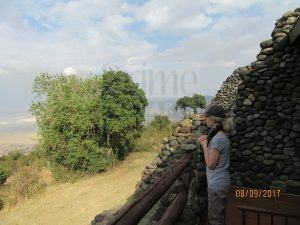 Located 6Km out of kisoro town, Mutanda is an eco-lodge owned by the community. Masaka to Mbarara (also known as the land of Milk because of high number of cattle in the area); the distance is approximately 138Km and lasts for about 1Hr 50min. Mbarara to Bushenyi: Drive distance is about 54Km and lasts for about 45Min. Bushenyi to Kisoro: Drive distance is about 191Km and lasts for about 3Hrs. Kampala to Mubende: Drive distance is about 150 Km and last for about 2Hrs. Mubende to Fortportal: Drive distance is about 146Km and lasts for about 1Hr 52min. The route takes you through the magnificent, breath taking Matiri Central Forest Reserve in kabarole district. Fort Portal to Kaseses: You will bypass one of Uganda’s Cement manufactures, Hima cement, as you approach Kasese Town. You will also cross rivers of Mobuku and Nyamwamba before you are finally in Kasese town. Existance of the Park is traced back as early as 1925 when it was part of the Albert National Park, a national park that was formed by King Albert I of Belgium. The Albert National Park was the first National park on the continent of Africa and was created primarily to protect the endangered Mountain Gorillas in the Democratic Republic of Congo (DRC). 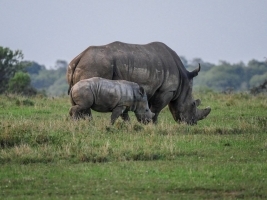 The park, under the management of the Belgian colonialists in the DRC, expanded into Uganda and covered the areas of Bwindi plains, Lake Edward and the Rwenzori range; and the now volcanoes National park in Rwanda. However, the Belgian Colonialists who were apparently in the territories of DRC and Rwanda thought it wise to manage only the portion that was fully in possession of the two countries that they governed, DRC and Rwanda. Uganda was under the British administration. A final decree was made by the Belgian colonialists, clearly stating the boundaries of the Albert National Park in 1930. The area of Uganda was cut out of the boundary, but however remained in the Virunga Conservation Area (VCA). The British administration then became the new management of the area; declaring it a game Sanctuary in the same year. 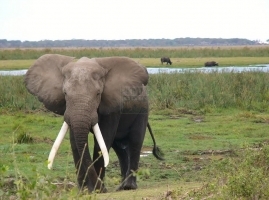 29 years down the road after Uganda had gained its Independence in 1962, the sanctuary was declared a National park later in 1991 under the government of Yoweri Kaguta Museveni, who had just became president in 1986. Mt.Muhabura, shared by Uganda and Rwanda, in Volcanoes national Park; Mt. Sabinyo, shared by DRC in Virunga national park, Rwanda in Volcanoes national park and Mgahinga National Park in Uganda; Mt, Gahinga wholly in Uganda, in Mgahinga National Park. The area where the park is situated has one of the most suitable climates since it is a few degrees south of the Equator; lying on the western arm of the Albertine Rift Valley; as well as being bordered by the Rwenzori Mountain range in the north, Virunga Mountain Range in the East and Volcanoes mountain range in the South. 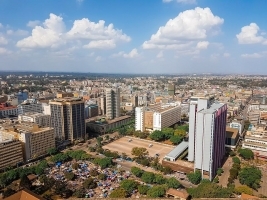 It has a rainy season that runs from March to April and from September to November. The month of October has the highest rainfall of about 260mm; and July with the least amount of rainfall totaling to about 10mm annually. During the rainy season, the entire park is covered in mist and temperatures are determined by altitude. The temperatures are cold and wet, with the high altitude from 2,227 to 4,127m having low temperatures of about 9°C during day and 20°C during day. Temperatures drop by about 6.5°C for every 1000m you climb. However, the rest of the year is the dry season with temperatures ranging from 15 to 28°C. The mountain gorilla’s fur is thicker and longer than other gorilla species which enables them to live in cold environments. They feed on bark, roots, flowers, fruit; and mainly leaves, shoots and stems (85%). Males eat up to 34Kg and females 18Kg of vegetation per day. A male begins mating between the age of 12 and 15yrs when he is in charge of a group. Females will give birth from the age of around 10yrs and will have off springs every 3 to 4yrs. Gorillas are generally shy, but when two groups meet, the two heads of both groups (silverbacks) could get into a deadly fight using their canines to injure one another. They will hoot, rise on their legs, throw- slap –tear vegetation, beat their chest with cupped hands, kick with one leg and thump the ground with their palms. 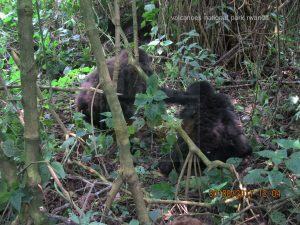 Mgahinga has a habituated gorilla group in Nyakagezi, 10km from the town of Kisoro. The group consists of a family of 9 gorillas. 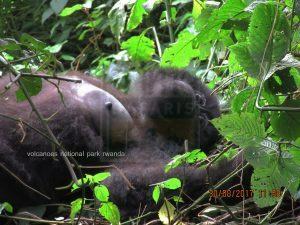 The family includes; A 50yr old leader and father to most of the gorillas, a silverback. 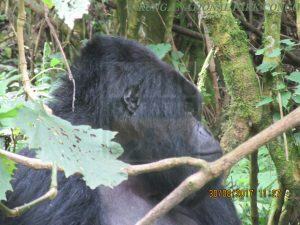 He has 4 sons, Mark and Marfia (silverbacks); Rukundo and Ndungutse (blackbacks). These love to play in the trees. 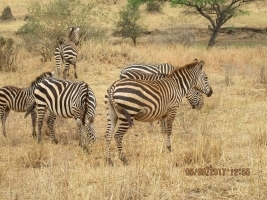 He has two females, Nshuti and Nyiramwiza; with daughters Furraha and Nkanda respectively. 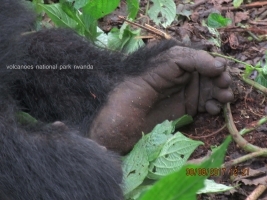 A gorilla tracking permit is required in order to track the endangered species. A pair of gloves, head gear, long stockings to protect from insect bites. A pair of long sleeved shirt or t-shirt, trouser and hiking shoes to protect from thorns and nettles. A water proof rain jacket, which shields you in case it rains while you are tracking. 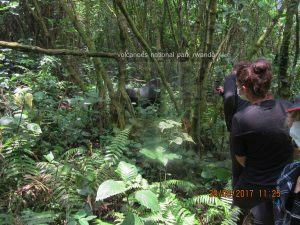 A tracker is required to keep a distance of about 27ft from the Gorillas. 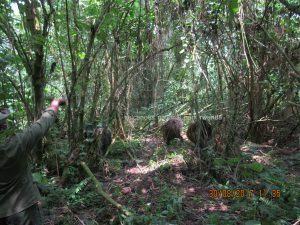 This is to ensure human safety and also minimize the possibility of transmission of human disease to the Gorillas. Drinking and smoking near the gorillas is forbidden. You can take photographs but without using the flash light. Rapid movements are not allowed as they may frighten the gorillas.